Organized under the National Land Settlement Administration (NLSA) of the Commonwealth Government headed by President Manuel L. Quezon, General Paulino Santos led the relocation of 62 Christian settlers from Luzon to the shores of Sarangani Bay aboard the steam ship “Basilan” of Compania Maritima on February 27, 1939. The 62 pioneers (mostly agricultural and trade graduates) were the first big batch of settlers to land in GenSan with the mission to industriously cultivate GenSan’s fertile expanse of land. After this first influx of pioneers, thousands more from Luzon and the Visayas have subsequently migrated into the area. This started the displacement of some native B’laan tribe to the mountains and lost their livelihood. The Blaan people are the original settlers of GenSan which they called Dadiangas during the time. The B’laans live a nomadic way of life in and around GenSan. Evidence of their early occupancy are the names of the places in the city which were derived from their native terms. One significant name is Dadiangas, their native call for a tree which has thorns on its trunk and stems that abundantly thrive in GenSan during the time. Under Indigenous Peoples Right Act IPRA law RA 8371, these Dadiangas trees are now protected and it is proven under the Philippine jurisprudence of the Supreme Court. In the present time, the B’laan tribe live side by side in harmony with the new generation of settlers and other immigrants. In March 1939, the first formal settlement in the city was established in ’’Alagao’’ which is now known as Barangay Lagao. Lagao district was known then as the “Municipal District of Buayan” under the jurisdiction of the deputy governor of the Municipal District of Glan. Until it officially became an independent Municipal District of Buayan on October 1, 1940 appointing Datu Sharif Zainal Abedin—an Arab mestizo married to a daughter of a very influential datu of lower Buayan—as the first district municipal mayor. June 1954, the Municipality of Buayan was renamed General Santos as a tribute to its great pioneer. This was made possible by Republic Act No. 1107authored by Congressman Luminog Mangelen of Cotabato Province. Population in General Santos reached up to 538,086, with a growth rate of 5.05% in 84,045 households, making General Santos as one of the most populous cities in the Philippines. Natives speak Ilonggo, a Hiligaynon dialect, followed by the Cebuano and Ilocano dialects. 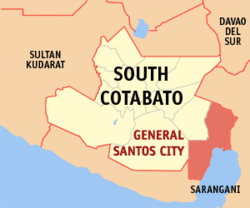 General Santos City has a total land area of 536.01 km2 (206.95 sq mi), with land use based on built-up areas such as commercial, institutional, industrial, livestock at 5,843.81 hectares of the total land area; special land uses such as agro-industrial, parks and recreation, pastureland and vacant lots in 23,320.95 hectares of the total land area; agriculture lands at 17,489 hectares or 32.63% of the total land area. Other land uses are based on forest areas and bodies of water in the city. commodities due to its fertile soil, good rainfall and typhoon-free climate. General Santos City is the largest producer of corn, coconuts, copra, pineapples, asparagus and rice and it also produces other high value crops such as exotic fruits, potatoes, vegetables, cut flowers and okra. The city also has the largest total daily fish landings in the Philippines and is the leading producer of sashimi grade tuna. Additional economic factor in the City is the presence of major economic infrastructure support facilities which has a standard comparable to international benchmarks. There is also the current International Standard Airport with a 3,200-meter runway capable of handling wide-bodied jets like Airbus 300 series and Boeing 747, catering direct flights and connecting flights to various cities in the Philippines. General Santos also boast of its world class Fishport Complex which has a 750-meter quay, 300-meter wharf for 2,000 GT reefer carriers, refrigeration facilities with 1,500 cold storage capacity, 60 tons/day ice plant, brine, air blast and contact freezers. The Makar Wharf is one of the most important ports in Mindanao and has now expanded. The City has 59 banks operating. There are also 49 pawnshops providing emergency loan assistance and 48 lending institutions. Since the year 2000, General Santos City registered 1,505 new medium to large enterprises businesses. The total investments were based on social and personal services, wholesale/retail trade business, manufacturing and mining & quarrying. It would do well to diversify the city’s industry to avoid over-dependence on its tuna industry. A modern agro-industrial estate with a cold storage terminal should be put up to support the outlying farm lands. General Santos City celebrates the Kalilangan every month of February. “Kalilangan” means festival, festivity or jubilation. It is a social gathering marked by exchanging of amenities among traditional leaders, elders, allies and subordinates in varying tones. In a broader perspective, Kalilangan projects a positive and dynamic meaning for it engulfs the artistic, humane and altruistic aspects of social interaction that takes place in any occasion or celebration. Kalilangan is a noble tradition. It is a complete work of art nourished and nurtured by rich cultural heritage that has withstand the test of time from generation to generation.